Now I am curious about the ‘question’ of the Googler. Was it a girl who was looking for Rolex Explorer opinions (for girls), or was it a guy who was curious about the opinions girls have on this watch? In either case, I will try to answer this one for the unknown visitor on this site who searched on this string. Scenario 1. 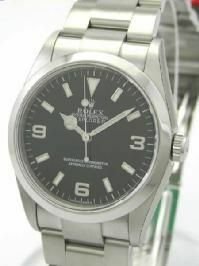 You are a girl and want to know how people think about this Rolex Explorer on your wrist. Well, first, you shouldn’t care what other people’s opinions are about your watch. Your watch represents you, and only you. And personally, I think a stainless steel Rolex looks great on a girl/lady. It is 36mm, so it will fit about any girl (also the ones with slim wrists) and it is solid, accurate and when you scratch or dent it. Just send it to Rolex and they will service it until it looks like new again. Scenario 2. Girls don’t care about your watch. At least, most girls don’t. And if you do buy this watch to impress girls, you better buy a larger watch I guess otherwise they won’t notice it anyway. P.s. Before I get more e-mails asking me to back things up (especially on the Adee Kayee and Louise Bolle scams :-)), take this post with a grain of salt (or two).